Scroll down to your next adventure! A sanctuary to nourish the body, mind, and spirit. Rejuvenate your body and impact lives! Ralia Retreats is on a mission to renew you and also to uplift the world as we support world causes. An organization that is loved and cherished by the founder of R & R is the Malala Fund. R & R is dedicated to supporting the Malala Fund through proceeds and mentorship. You can donate directly to the Malala Fund on her website www.malala.org. And, but supporting the Ralia Retreats initiatives you are supporting the Malala Fund as well! Create a moment with family or with friends! For those looking for a weekend away from it all, a place to hold a business gathering, or a place to vacation with the family we invite you to try it in style. Ralia has everything you need to have the perfect weekend - luxury accommodations, nature's best offerings, and a beautiful view. Our mission is to provide a place of rejuvenation to nourish your body, mind, and soul. We envision an international luxury retreat brand situated in geographically unique locations that provides the people who visit a home away from home. The Ralia Retreats is a home away from home that is designed to provide many opportunities for deep relaxation as well as exercise. The chalet is surrounded by a small mountain (Montagne Noire) and a quiet lake (Lac Boeuf). In the summer plan to swim, kayak, paddleboard, hike, bike, run, eat from the garden, and enjoy the gorgeous summer weather. In the winter plan to snowshoe, downhill ski or cross-country ski, try a Scandinavian spa experience, do hot yoga, and cozy up to the rustic fireplace. Our home can be your home. Our family can be your family. 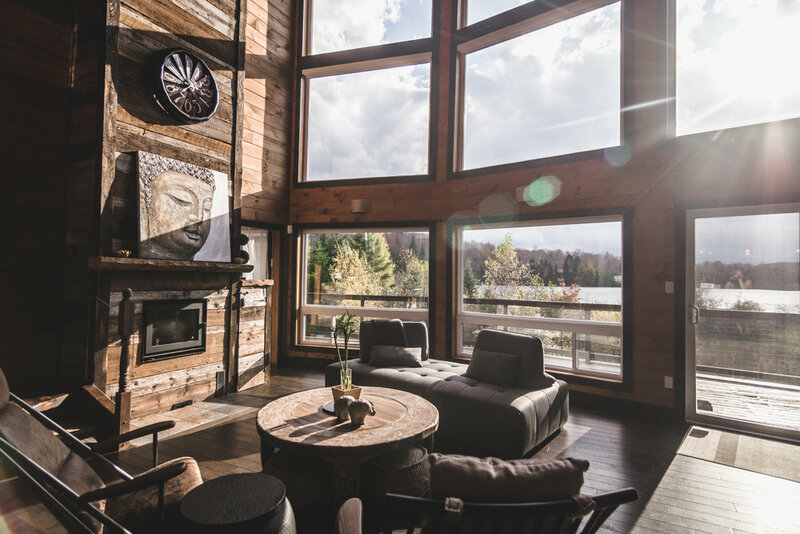 With reclaimed architectural features from local farmsteads and a location close to some of the area’s best ski runs, Ralia Retreats is the place to enjoy the Laurentians. Laid out over three levels, this four-bedroom luxury vacation rental has space for up to twelve friends or family members who want to enjoy the lake, go on a hike in a neighbouring provincial park, learn to ski, cross-country ski, bike, fish, hunt, and enjoy the neighbouring town of St-Donat. Guests of Ralia Retreats are able to enjoy a private yoga room equipped with hot yoga warmers, a hot tub, and a sauna. After a day of skiing, pour a glass from the wine fridge and cozy up by the fireplace or in front of the TV; in warmer weather, sip your drink on the large balcony, by the outdoor fire-pit, or in the screened-in bug-free gazebo overlooking the beautiful motor-boat free lake. Ralia Retreats was built in 2012 by a parisian family who made a beautiful home with many modern comforts. Features like soaring ceilings, large windows and a bright, open-plan great room. A unique furniture set was selected to match the house but to make comfort a top priority. The movable couch and enveloping arm chairs let everyone gather in comfort in the sitting area, and the dining area seats 12 in espresso-hued seats. The fully equipped kitchen has state-of-the-art appliances and a convenient breakfast bar. Each of the four bedrooms at Ralia Retreats has easy access to a bathroom. The master bathroom has a large soaker tub, and heated floors. All bedrooms can conveniently combine the 2 single beds to make a luxurious king bed. The basement den can be a cosy office or T.V. room or an extra bedroom with a queen-size sofa-bed. A $500 deposit is due upon booking. A $200 housekeeping is charged for every stay. Additional housekeeping, hosting, food services, and massage services can be requested during your stay. When you book a stay at Ralia Retreats you are offered the option to add on food services overseen by sports dietitian, Pearle Nerenberg, owner of Eat This for Performance. Your vacation food can be designed with your health and activities in mind! 1- Ready-to-Eat: Gourmet health food will be in the fridge and ready to heat throughout your stay - hassle-free health! 2- Cook and go: Your grocery shopping is done for you and a list of Pearle Approved recipes will await you to match your groceries. Chef Rachel Ouellette delivers balance and loud flavour meals with a tranquil flare. Psssit! For a VIP experience, do not forget to ask for Racines Traiteur Santé when booking with Ralia Retreats. Public retreats will be available on an on-going basis. Keep checking back for more! If you are interseted in running a retreat at Ralia contact Pearle!